Torpor Definition - Do Birds Hibernate? Torpor is a state of slowed body functions used to conserve energy and heat, similar to hibernation but not as extreme. Torpor is generally only a short-term state, such as a few hours or overnight, though in some cases and for a few species it may last several days or weeks. 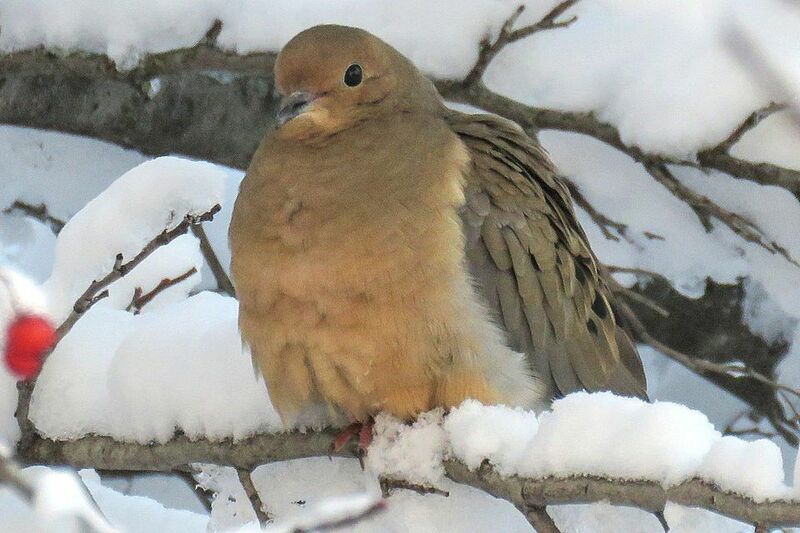 Birds that may face extreme winter conditions will use torpor to survive long winter nights or severe storms. Torpor can be dangerous for birds. During the time when a torpid bird's metabolic functions are slowed, their reflexes and reaction abilities are also stunted, making them more vulnerable to predators. This is particularly true at night, when nocturnal predators may be alert for easy prey and torpid birds cannot react to danger as quickly. Many birds first come out of this sleep-like state through shivering, and they may sun themselves for several minutes while awakening. During this waking up period, their reactions are still slower than normal. It can take from several minutes to nearly an hour to awaken from torpor, and a ready food source should be available for the bird to replenish its energy supply immediately. If no food is available, the bird can remain vulnerable because it cannot rejuvenate sufficiently. Hibernation: Hibernation is a long term state of reduced metabolic activity and often lasts several days or weeks at a time. It is a seasonal condition and may occur during either summer or winter depending on the species. Torpor, on the other hand, is a much shorter period and can occur at any time. Only one bird species has been noted as truly hibernating - the common poorwill. This species will also use torpor regularly. Sleeping: When birds sleep, their metabolic functions may slow slightly, but the changes are not as radical as those during torpor. Birds will sleep daily, but may not enter torpor unless conditions are extreme, and some birds will never use torpor at all though they still sleep regularly. Sunning: When birds are sunning, they may appear to be lethargic and sleepy, similar to how they may appear if torpid, but there is no change in body temperature, respiration or other metabolic functions. Birds can resume their normal activities immediately when sunning, and there is no warm-up period necessary as there is after being torpid. Many birds will use sunning as a way to come out of a torpid state, however, and the two are easily confused. Illness: It can be startling to see a torpid bird and it is easy to think the bird is in some way sick or injured because it is not moving or acting as expected. Torpor is a natural, healthy state, however, and in fact can keep birds healthier because they are conserving energy that they will need for foraging, preening and staying alert at another time. In addition to birds, a number of animals are known to enter torpid states under different conditions. Bats, mice, hedgehogs and other rodents and small marsupials commonly use torpor.